Join us in honor of Baltimore Montessori Public Charter School’s 10th anniversary at the HANDS ON! Gala on Friday, April 13, 2018 at the Baltimore Museum of Industry! We are delighted to welcome best-selling author and social entrepreneur Wes Moore as our Honorary Chair. Celebrate 10 years of joyfully engaged learning at Baltimore Montessori Public Charter School! Join us on Friday, April 13, 2018 for the HANDS ON! Gala -- our annual, interactive event to raise fun and funds for Baltimore’s only public Montessori school. We are delighted to welcome best-selling author and social entrepreneur Wes Moore as our Honorary Chair. A longtime friend and supporter of our school, Wes Moore is also a television producer, political analyst, and decorated US Army officer. 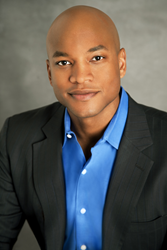 Wes Moore is the author of The Other Wes Moore and The Work, both of which are New York Times Bestsellers, and currently serves as CEO of Robin Hood. Our annual interactive event celebrates Baltimore Montessori Public’s mission of joyfully engaged learning by encouraging guests to participate in a variety of hands-on activities throughout the evening. Our event includes all new hands on activities, music and dancing, delicious food, drinks, and specialty cocktails from popular local restaurants, an enticing silent auction, and so much more, all at the Baltimore Museum of Industry’s stunning waterfront location. We anticipate selling out, with over 500 attendees expected. Baltimore Montessori Public Charter School is a mission-driven school in Greenmount West, the urban heart of Baltimore’s Arts and Entertainment District. Together with our community partners and families, we transformed two vacant buildings and an empty lot, and opened our doors in 2008 as Baltimore’s first public Montessori school. Today, we serve 450 students in PreK3 through 8th grade. Our school features beautiful spaces for learning and play, an extensive Seed to Table program, visionary leadership, talented staff, and an engaged parent community. In our joyful and diverse learning community, students explore a rigorous curriculum and engage in relevant projects that promote independence, critical thinking and self-regulation. Our whole child, hands-on approach supports students to develop the skills necessary for academic and social success, and provides meaningful opportunities for students to explore the arts, develop their capacity for peace, and prepare for global citizenship. We remain the City’s only public Montessori school, with over 1,400 students on our waiting list. Note: Ample parking is available. This is an over 21 event.